That's the very best kind of tree! I've thought about putting up a themed tree in the past, but I just don't think you can beat a tree filled with treasured memories! Oh yes! Our tree is definitely a memory tree. Our son even tok each of the shipping labels off of every box the year we moved and made them into an ornament.. It’s still hangs on the tree. A perfect green square that says Allied Van lines! Most of our ornaments have memories attached to them. Some of mine do and I enjoy them as well. Most of mine are either something I received as a gift, picked up while traveling, or something I collect. There are 2 from my childhood that I treasure. And I give my kids and grandkids a new ornament every year. You bet! I have the ornaments we hung on the tree when we were kids...then there are some that Colin made. The one we get a kick out of each year is the ornament he made in kindergarten: his face at the top of a green tree (construction paper)...then the kids added glitter and a piece of gold glitter landed on one of his teeth - LOL. We have a number from Fletcher's Mom as well. I think that is the BEST kind of tree to have. We don't do a tree right now, but I still have all of the decorations and almost ALL of them have some meaning or are ornaments I have made. Oh yes Nancy. I love your unconventional! Does a cat named Pie in the tree count? Oh I love that! Our ornaments are similar in that a lot of them are kinda weird - but they are from family, or travels, or are something we just liked. If you can't have a fun Christmas tree, what's the point, you know? Most definitely. Unfortunately I don't remember the stories very well. I do think I still have an ornament that hung on my grandfather's tree though. 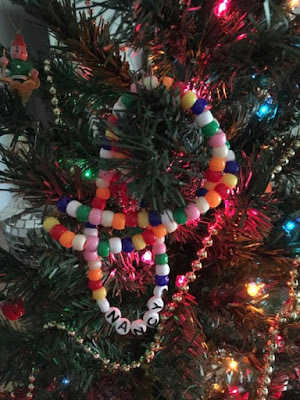 My great aunt took old costume jewelry apart and made "icicles" out of the beads. They look old up close but really sparkle when the lights hit them. I have about half of the ornaments that are memory ones-what a story the tree tells! Yes all ours have stories. 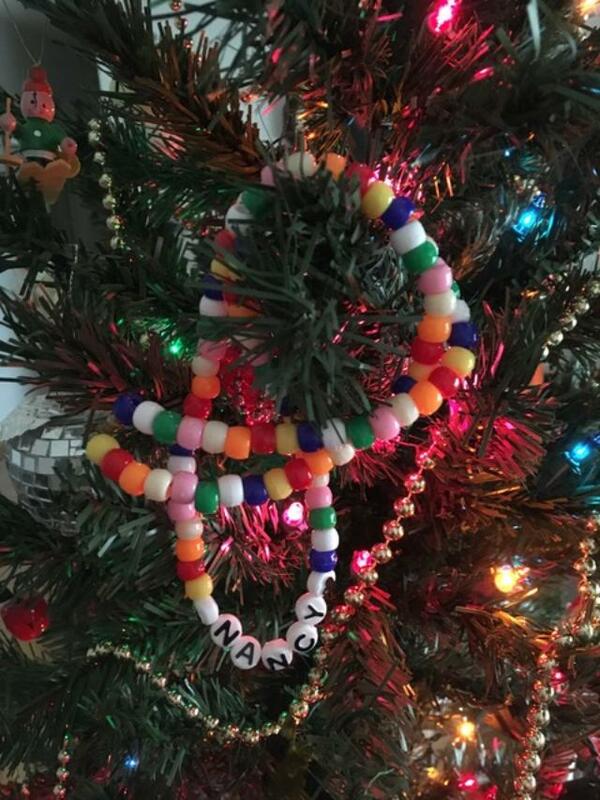 How sweet that Stephanie made you a necklace and you still put it on the tree!